Although your guests may argue that this is not a “real” potato salad (of course, there is no mayonnaise) a single bite should settle the score. This bright, vinegary side dish has been known to take center stage at my barbeques, so be sure to serve it alongside hearty entrees that will stand on their own. 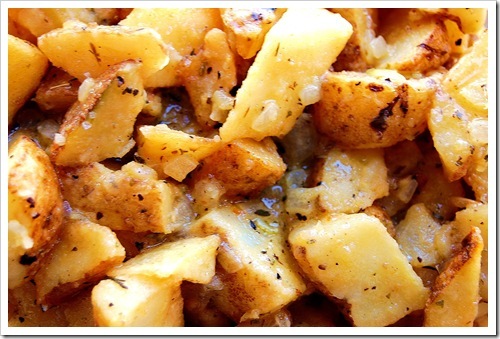 Spread the potatoes in an even layer in a microwave-safe dish filled with enough water to cover the potatoes. Microwave 8-12 minutes (this will vary a lot) or until the potatoes are fork tender, but not fully cooked. Drain and pat dry. Meanwhile, spread the diced onion and pepper in an even layer on a rimmed baking sheet and bake until they have softened, about 15 minutes. 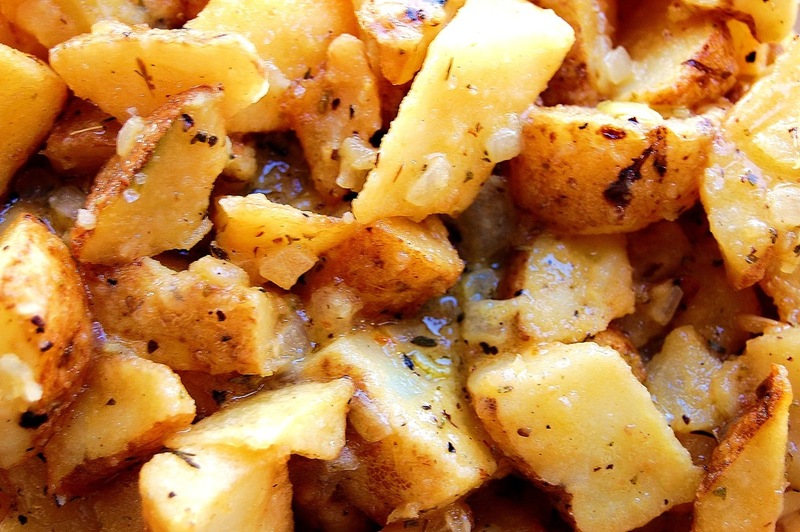 Add the par-cooked potatoes and toss with a little olive oil to coat. Bake another 20 minutes, or until the potatoes are golden brown. Meanwhile, whisk together the remaining ingredients in a large bowl. Season to taste with salt and pepper. The dijon vinaigrette is a balancing act between bitter, sweet, salty and spicy. Adjust each of the ingredients until the vinaigrette stings your tongue, but finishes in your mouth with a slightly sweet, rounded flavor. Toss the potatoes and vinaigrette together on a serving bowl and serve warm or room temperature. If you want to cheat a little (I won’t tell) you may be able to get away with frozen roasted potatoes. If you’re lucky enough to live near a Trader Joe’s, they sell a package of frozen potatoes with roasted veggies that works great for this recipe. It can be our little secret.